Short stories by a pioneering female author who went on to become a member of the Science Fiction and Fantasy Hall of Fame. Shambleau: First published in Weird Tales, Moore’s bizarre, imaginative, and wildly acclaimed debut features space outlaw Northwest Smith and his meeting on Mars with a strange young lady whose turban hides a terrifying secret . . .
Black God’s Kiss: The debut of Jirel of Joiry, one of the classic heroes of sword and sorcery and fantasy’s first true strong female protagonist. As cunning as she is fierce, Jirel descends into a nightmarish land beneath her castle to find the instruments of her revenge . . . The Bright Illusion: One man’s journey to a mind-bending, terrifying planet of blinding colors and impossible angles, filled with unutterable horrors and strange temptations . 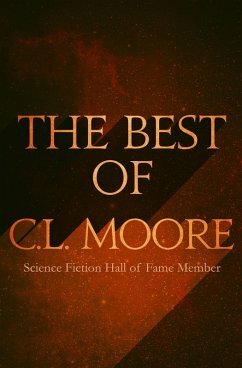 . .
With these and seven additional stories that evoke the enduring spirit of sci-fi and fantasy’s early days, The Best of C.L. Moore is a treasure that belongs on the shelf of any reader of speculative fiction.